Please visit https://nchs.8to18.com/ to register for summer camps. Summer Calendar available on documents page. Off Season Workouts are Every Monday, Wednesday, & Friday that school is in session. Please contact Jennifer Lowrance if you are interested in any of these positions. Want to be a sponsor of Ironman Football? ​Please visit the Sponsor page for more information. Please visit the volunteer tab to sign up for volunteer opportunities. ​Text @FOIF to 81010 to receive text updates/info about NCHS Football. 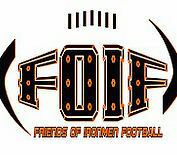 Check out the FOIF Page to see meeting dates, minutes and other information about FOIF. Click on picture to see more information about being a sponsor of Ironman Football. Click on the picture for more information on how you can become a sponsor of Ironman Football. Email friendsofironmenfootball@gmail.com with your player's name & current grade level and your name, email & phone number to be added to the appropriate email and Remind list. Please note what payment is for. View the NCHS Ironmen "The Normal Way", "We are Normal Community", “Why Not Us”, & "Preparation" videos. Thank you to Tyler Kern and Totally Kreative Video for their creativity!